The Lord Ruler is dead, his thousand year reign ended and the kingdom freed from his brutal tyranny. But the Survivor, Kelsier, is also dead, and it is up to Vin, Elend Venture, and the rest of Kelsier’s crew to rebuild a new government. But it won’t be easy. Elend’s father has gathered an army to conquer the city for himself, and a rival lord from the North is also laying siege to the capital city. Complicating things further, an army of ferocious giant beasts is heading their way, too. As the most powerful Mistborn in the land, and the one who slew the Lord Ruler, Vin has become almost a god herself in the eyes of the people, and they are sure she can save them. But Vin has her own problems: the Mists are acting strangely and seem to be killing people more and more frequently, there is another Mistborn challenging Vin, a ghost-like creature seems to be stalking her, and she is hearing strange thumping sounds. As the siege of Luthadel draws to its height, an ancient legend may be the key to their salvation. But no one knows for sure what the Well of Ascension really is, or what it may do to anyone who finds it. Book two of the Mistborn trilogy continues almost directly from The Way of Kings, and is as interesting and well-done as the first was. We meet many old familiar faces, and a few new ones. The plot is intricate and the action moves along well, with just a few slower spots. The setting is detailed, even though most of the action takes place within the city of Luthadel. 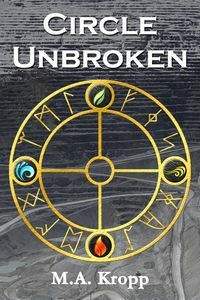 The puzzle of the Hero of Ages and his- or her- connection to the Well of Ascension has enough twists that it had me sure I knew the answer until the end. (I was wrong.) The ending ties up the main plot points and leads the way into the third book without leaving the reader hanging at cliff’s edge. Another well-written story from Sanderson, and one any fan of large, epic fantasy should enjoy.